Me is happy chappy with the new toy! 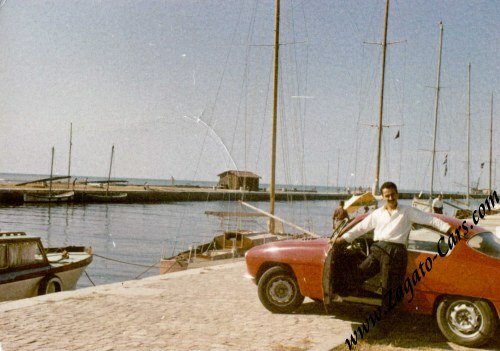 In the picture you see the previous owner who acquired the car in April 1955 directly from Zagato. It does (almost?) everything a car needs to do but yes, it needs work, no won't be embarking on a full-fledged restoration for the moment. At Alfa Romeo, we have the ever-so-helpful Marco Fazio to inform us about the factory details of our cars. Last edited by Zaagmans; 01-28-2014 at 10:06 AM. 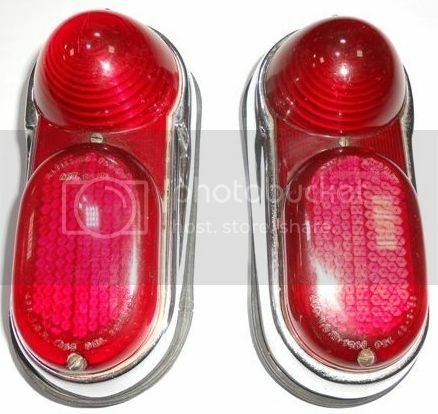 I believe these to be flat-based first series Fiat 1100 103 Berlina lights? Btw congratulations for you purchase. Fiat doesn't have a Marco Fazio but mr. Castagnola at the Archivio Fiat: massimo.castagnola at fgm-cc dot com. He could give you a scan of the registry corresponding to your chassis number (upon payment of €40). However, I think that the Zagato factory could help you as well. Great! Thank you so much, Francesco! Will let you know what they are able to come up with. I see that you're based in Milano. Would you happen to have any good contacts for sourcing the tail lights and serveral mechanical parts (engine bearings, brake cilinders etc)? Last edited by Zaagmans; 02-05-2014 at 02:23 AM. as you could imagine finding spare mechanical parts for your car should be quite easy as they belong to Fiat 1100-103. They have a large spare parts stock and they speak English, so you shouldn’t have problems to deal with them. However, if you need help PM me. Last edited by Zaagmans; 02-12-2014 at 03:19 AM. Seventeen Zagato-bodied "Fiat 1100/103" cars are identified at this time in my listings with leads to as many as nine additional similar cars not yet identified by chassis number. There is the possibility of some overlap. In addition, there are nine of the similar version prepared and sold by Siata that are identified thus far ... and a good solid lead to another. There probably should be several additional examples to identify since the Siata was homologated as a "GT" in the 1250cc version. And, since a good number of the "Fiat" references come from identifying cars seen racing in photos, there could well be a number of similar examples that were used as "gentlemen's GT" cars on the street but which never were raced and hence, not yet seen in photos? Our car was owned by Elio Zagato at one stage (but I believe it was not uncommon during that era for Elio to register cars on his personal title). It does have the full "Abarth kit" as outlined in the homolgation papers. It was registered 230567MI, maybe you can identify it in your records? Hello "Zaagmans". Thank you for sharing your news. Both the chassis number and the Milano plate number are new to my listings. I expect that there are many additional cars awaiting identification and description. The chassis number "014461" implies a completion date (as a Fiat, most likely) between June and August of 1953. 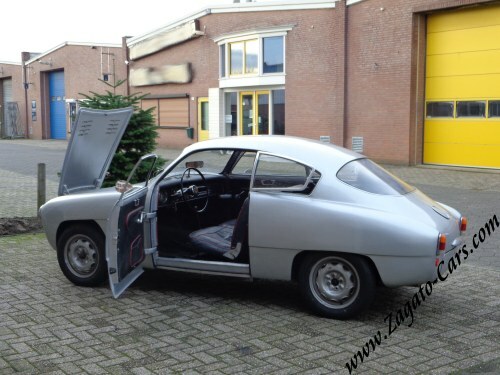 If Zagato took longer than normal to build a body for this chassis, it is possible that the car was bodied by Zagato from new. It seems a bit unlikely but some research should give us a better idea of what is actually "likely". The Milano plate number was issued December 1953 and this implies to me that we will be seeking an explanation as to what happened to the car between July (approximately) and December of 1953, the latter date seeming to be the most likely time period of the car's completion as a "Zagato". It is certainly possible that the car was registered elsewhere during that time period and it is also possible that some earlier (original) Milano plates were lost only to be replaced in December. 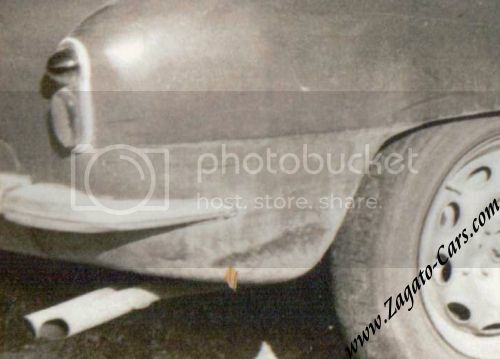 It is possible that the car was bodied by Zagato at some time earlier or later than December of 1953. I will send a PM to you introducing a helpful Italian friend who will research the Milano plate for you. This research will inform us of the paper trail ownership of the car according to the existing Italian legal records that are relatively easy to find and purchase if there are no complications. There can be minor errors and imprecisions, perhaps sometimes a "hidden owner"(?) for one reason or another, but it is often the best place to begin to learn about a car's general ownership and location details. Although far from certain, sometimes this paper research will reveal the chassis price and the body price and might even give origin dates for each of those components. We sometimes learn who borrowed money from whom, either to purchase the car or after the purchase, using the car as legal collateral. We cannot know until the research is done. I will organize and share some more in a few days about some general observations of Elio Zagato's racing in Zagato bodied Fiat 1100 cars during 1953 and 1954. He used one car (that he owned) for at least a few events during the middle and latter events of 1953 ... and perhaps for the majority of them? But, it also seems clear that he used another car or two (or more?) as well. We will need additional information before we can identify some cars used on some events. We have more to learn and what you have shared can be used as a starting point for a second step in that process. I happened to come across a copy of your 1994 ICAR and I indeed saw a good number of cars listed there already. BTW: this is the first time that I found a copy of the ICAR; is it that scarce? We have an Estratto Cronologico with the Zagato which I'm now translating but it indeed gives some highly interesting insights. As we are now in the process of getting the car back on the road, we would need pictures of photos of the original jacking point and its location. Is it the same as on the original 1100 103 Berlina? How was it attached to the floor? What does it look like? Both jacking points are missing from our car. 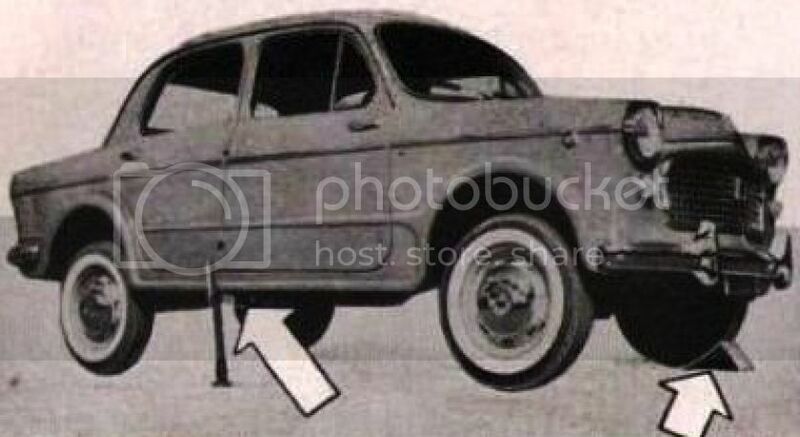 We only have the picture from a 1100 103 Berlina instruction manual that gives a rough idea of where it is located but we would need more exact info. Is there anybody who can help us out here?